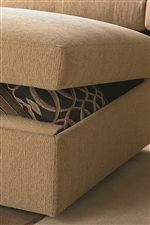 Expand on storage and seating solutions with this square ottoman. Its lift top is perfect for storing pillows, blankets, or any other small items you might need in your living room. 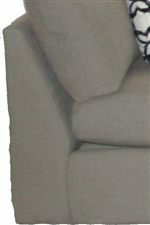 The cozy fabric makes this a comfortable extra seat that easily fits right along with the sectional sofa. This is a smart option that you won't want to miss out on. 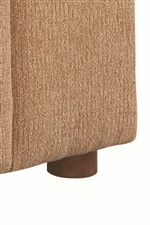 The Beckham Upholstered Storage Ottoman by Bassett at Wilcox Furniture in the Corpus Christi, Kingsville, Calallen, Texas area. Product availability may vary. Contact us for the most current availability on this product. The Beckham collection is a great option if you are looking for furniture in the Corpus Christi, Kingsville, Calallen, Texas area.